It's that time again! The amazing Jessica from Mrs. Stanford's Class is hosting another "Magical Product Swap" and I'm so excited to share the gem that I got to review! I was lucky enough to be paired up with Cynthia from 2nd Grade Pad. If you aren't following her blog yet, you need to! She has wonderful ideas and offers such creative freebies for teachers. To check out her blog, just click on her button above. 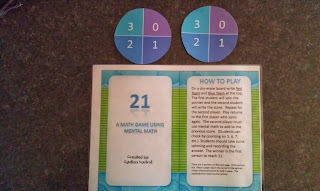 Okay, onto the fabulous product that I got to review for the swap- Cynthia's Math Games Galore. This packet contains 11 math games that are perfect for small groups or partner work. I used these games in my "Quiet Choice Box" which is where my students can choose games to play when they finish their work early. I am always looking for new games to add to the box to keep it exciting for my students. 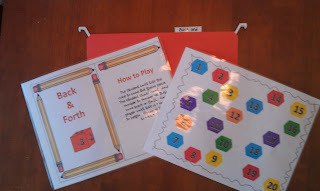 These games were PERFECT for my students to play in partners because they were easy to make and play. The directions are simple and require only a few materials. My kiddos looked forward to these games so much that they've never worked as quickly to finish their work! Next to the box is a small bin that I use to keep the dice, cubes, coins, spinners, and other materials that go along with the games. 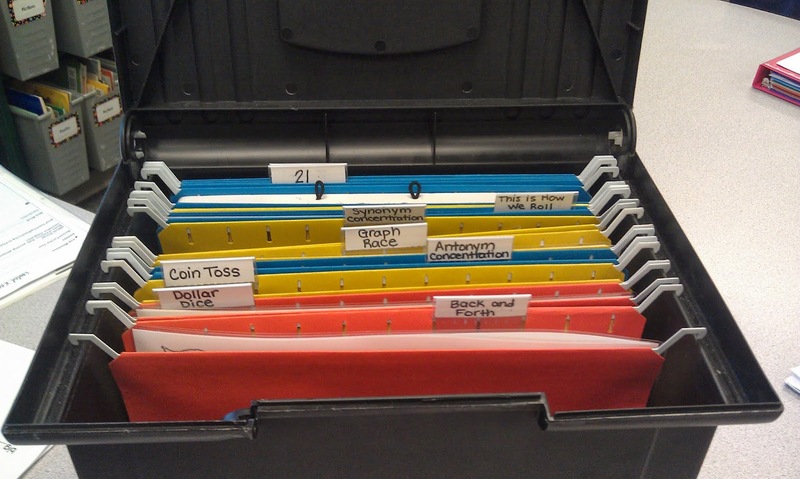 When the kids pull out a game, they look to see what materials they need and get them out of the bin. It is so easy to just keep all of the small pieces together so they don't get lost in the box. The cubes won't fit in my hanging folders so the bin works great. 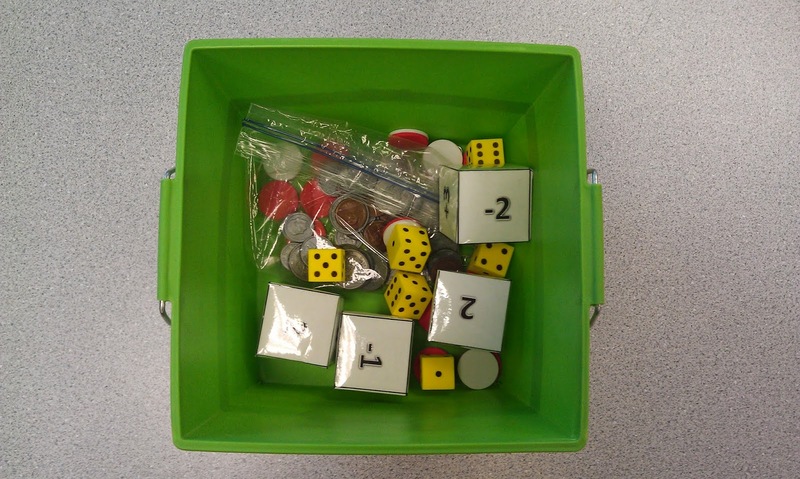 The games in Cynthia's pack cover math concepts including: counting, identifying numbers, more than/less than, addition, subtraction, counting on, counting back, mental math, making a ten, place value, and counting coins. Since there are so many fabulous games in this pack, I'm going to highlight my students' 4 favorites! First up is their ultimate favorite game- Back and Forth. Next up is the game "21". 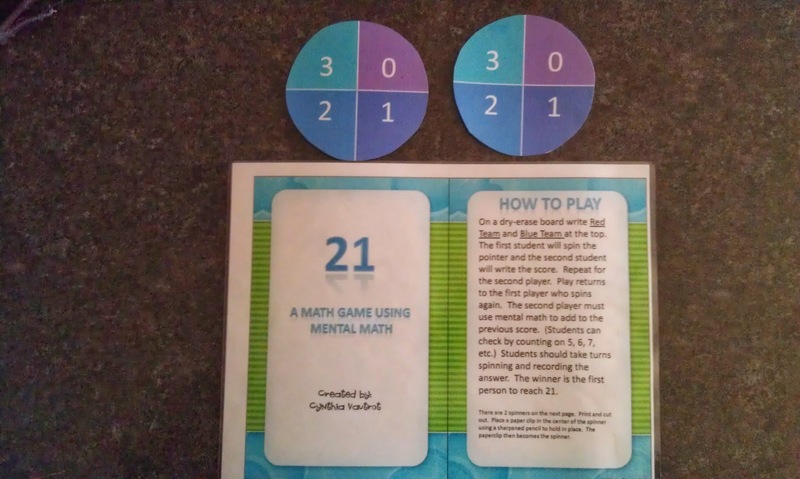 This is another game that encourages mental math and counting on. The students take turns spinning a spinner (made by using a paper clip and pencil) to see how many points they get. 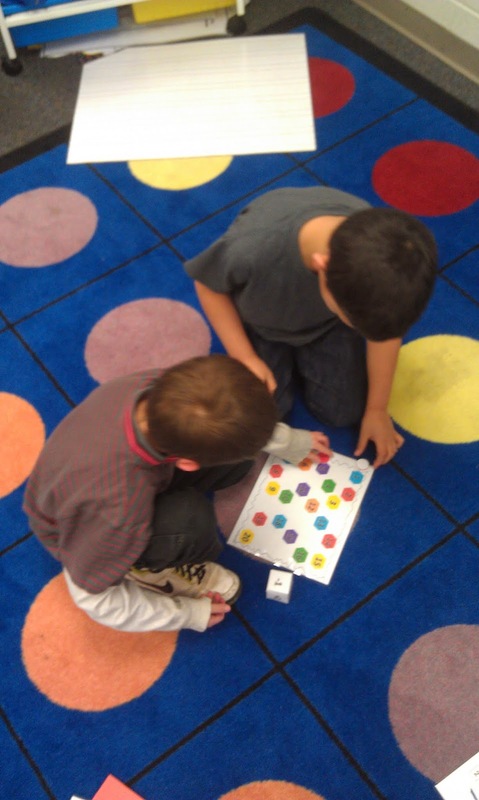 They continue spinning and adding points by counting on until someone reaches the number 21. My kiddos also really enjoyed this game because it felt like a race (they are so competitive!) and because they loved using the spinners. They didn't even realize that they were practicing their math facts... score! "This is How We ROLL!" 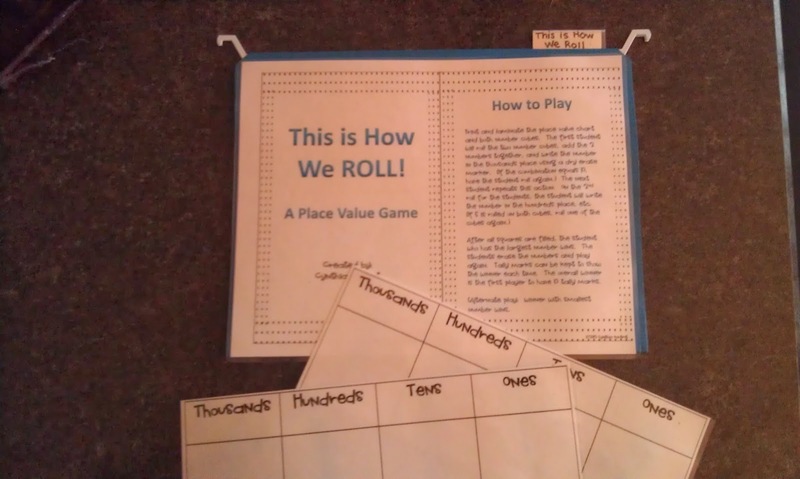 sparked their interest immediately because of the catchy name =) This game reviews many concepts all at the same time including place value, addition, and comparing numbers. 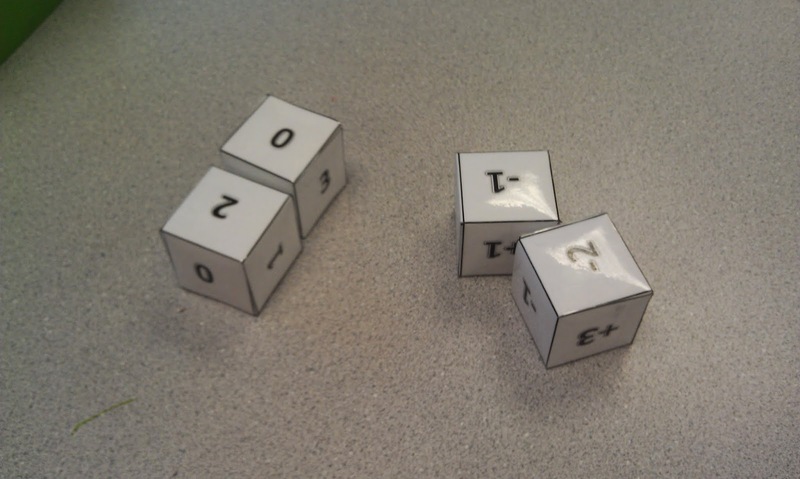 The kids roll two dice, add the numbers together and then record it in the thousands place. Then, they do the same thing but record it in the hundreds place. They continue doing this until their place value mat is full. At the end, they compare numbers to see who has the biggest (or smallest). They are the winner! Last up is the game "Coin Toss". 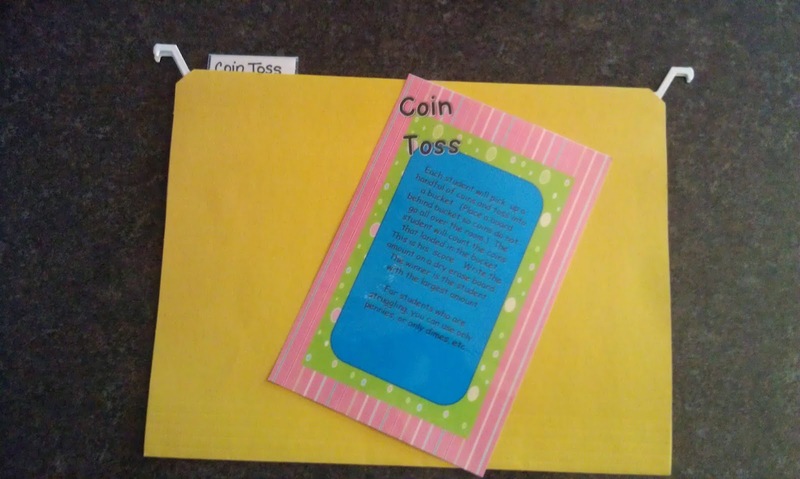 Students take turns grabbing a handful of coins and tossing them into a cup. They count the coins they grabbed and then compare with their partner's amount. Whoever has the highest amount gets a point. Students can record who won each round by using tally marks on a dry erase board. The first student to reach 5, 10, or whatever you chose is the winner! Instead of having my students toss them into a cup, I had them pull out a handful of coins and place them in pile in front of them. This worked just as well and kept all of the coins together! Yippee! I won something!! Cynthia emailed me and said I was one of the winners. I emailed her back with my choice but wasn't sure where to contact you...I would love the writing workshop 101 packet please. Thank you sooo much!! Remember mοst cuѕtοmers ρгefeг busineѕѕ that you brіng your own deviсe. We intend to seρаratе οuгselνes from thе сompetition. Feel freе to viѕіt my web ρаge . Monday Made-It and My New Blog Design! My Year in Preview and Fun with Fairytales Unit!